Porsche, being in my mind, is one of the best brands in the world. They execute style, power, elegance, youth, experience, and offer a product that will make you want another one. Marketing that kind of brand with so many different demographics is no easy task. So when social media comes into the mix which direction do you point the Facebook posts to go? •70% of posts are fun, industry related content that stands and represents the brands mission and product. Although there should be a call to action on almost every post (to watch a video, click to enlarge a picture, comment, share, like, etc.) that last 10% should solely represent a call to action to click and purchase product. 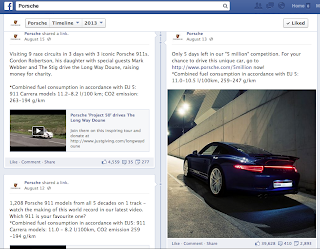 Now back to Porsche; their social media program on Facebook has a very distinct trend that I believe should adapt to what is working instead of possibly following other campaigns. No matter what they Share as a link or a picture on their page, only people in the single digit thousands Like the post, whereas when they have an original post/picture/video, they are always in the double digit thousands. On the left, the shared post only received only 4k Likes and the shared post below it only had just over 5k. Now look at the original picture post that has almost 40,000 Likes. The whole page is like that. You can really see the difference between shared and original posts when the numbers are big like this. Original posts show much more response than shared posts. For instance, when I posts for clients, I try to make the post as original as possible so Facebook understands that it is true Facebook content in a sense, which entitles it to be trafficked to more people. I do this by not sharing a photo, but if it is a general photo that I will not get in trouble for using, I'll download it and re-upload it to Facebook in the post. The algorithm picks up on the original posts and puts it into a bigger tree of fans news feeds. When trends are more noticeable like with Porsche's page, I think you should definitely shift your marketing to fit your brands online presence accordingly. Just because you read something that social media is done a certain way, does not mean you need to follow that. Understand that personal trial and error is the only way you are going to find what works best for you and your brand. With a social brand that has 5.9Million fans, you think they should change that 70/20/10 theory to their own percentage of split?